One of the first “fancy” things Leah and I ever baked was a batch of cream puffs. I’m not sure how we made that selection, but I’m glad we did! Ever since, we’ve had a fondness for anything involving pâte à choux. 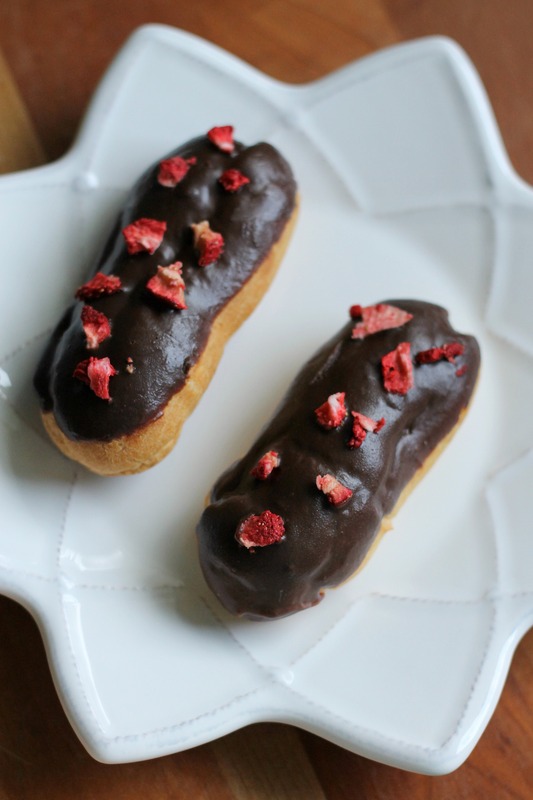 When one of the blogs we follow posted a recipe for chocolate covered strawberry éclairs recently, we knew we had to make it- it was just a matter of having the time to get around to it! We finally did, and these were truly amazing. The traditional éclair shell is filled with a thick and creamy strawberry pastry cream and then topped with chocolate ganache. You can also top yours (optionally) with chopped freeze-dried strawberries. These are not too difficult to make, but will surely impress your family and friends. Prepare the pastry cream 2-24 hours in advance. Bring milk to a slight simmer. In a medium bowl, whisk together the eggs, yolk, sugar, strawberry purée, cornstarch, and salt until well-combined and free of lumps. Slowly whisk 1/4 cup of the hot milk into the eggs. Continue adding 1/4 cup of the hot milk at a time until half of it has been added. Whisk the egg/milk mixture back into the remaining hot milk in the pot on the stove. Whisk over medium heat until the mixture thickens and begins to bubble. Cook for 1 more minute. Remove from heat and whisk in the vanilla, and if using, food coloring. Pour the pastry cream into a heat-proof bowl and press plastic wrap against the surface so that a skin doesn’t form. Refrigerate for 2 hours or overnight. For the eclairs: Preheat oven to 425 degrees F. Line two baking sheets with parchment. In a large saucepan, combine milk, water, salt, sugar, and butter over medium heat. Bring to a full boil. Add the flour all at once and stir with a wooden spoon until the mixture is cohesive and pulls away from the side of the pan (2-3 minutes). Transfer dough to stand mixture bowl fitted with paddle attachment and add eggs one at a time, and mix well after each addition, scraping the sides with a rubber spatula as needed. Spoon a portion of the dough into a pastry bag fitted with a 1/2 in. round tip. Pipe out 5 inch long/1 inch wide tubes for large eclairs or 3-4 inch long tubes for mini eclairs. 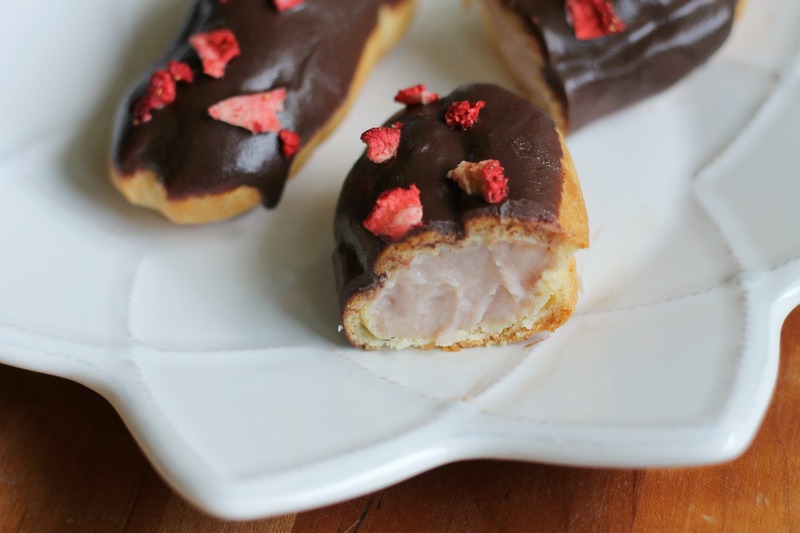 Allow 2 inches in between each eclair so that it can puff up. Smooth out any imperfections with a damp finger. Bake for 10 minutes until puffed and starting to brown. Reduce oven temp. to 375 degrees and bake until hollow inside and evenly golden brown on the outside, about 12 more minutes. Remove from the oven and poke a small hole in the end of each shell to let steam escape. Let cool fully on a wire rack. For glaze: Combine chocolate and corn syrup in a heat-proof bowl. Heat cream until it starts to bubble a bit and steam, then pour it over the chocolate. Let sit for a minute or two, and then whisk until completely smooth. To assemble:Spoon pastry cream into a bag fitted with a small tip. Fill the shells until the start to feel heavy. Dip top of each eclair in the glaze, letting excess drip off, and then place on wire rack. Sprinkle with crushed freeze-dried strawberries, if desired. Serve immediately or refrigerate and serve within 6 hours. Enjoy!